For the past seven years, BronyCon has been a constant within the “My Little Pony: Friendship is Magic” fandom. Tens of thousands of people have walked through our doors to be a part of our community, with many more working behind the scenes to make it all happen. It’s been a wild ride, but all rides end eventually—and BronyCon 2019 will be our 11th and final event. As a group, we did not come to this decision lightly. Thousands of hours, hundreds of people’s efforts, and gallons of unicorn magic are put into every BronyCon. It’s a hard job, and one we do with love for the community. Love for the community that helped us make a major shift in cities in 2013 when we moved from our original New York home to Baltimore; the community that came out over ten thousand strong to set the record for the largest My Little Pony convention the world has seen; and the community that has raised over $155,000 for incredible charities like CureSearch. However, as the fandom ages and changes, so too does the convention scene. Activity in the community has slowly been declining for the last several years, and while many of us wish things could stay the same forever, the one constant in life is change. At BronyCon, we could try to change, but we feel that to do so would cause us to become something that is not BronyCon. It would not be the event we know and love, and that we look forward to attending all year. Rather than let our fire dwindle into embers that eventually fade away, we wish everyone to remember BronyCon at its best. 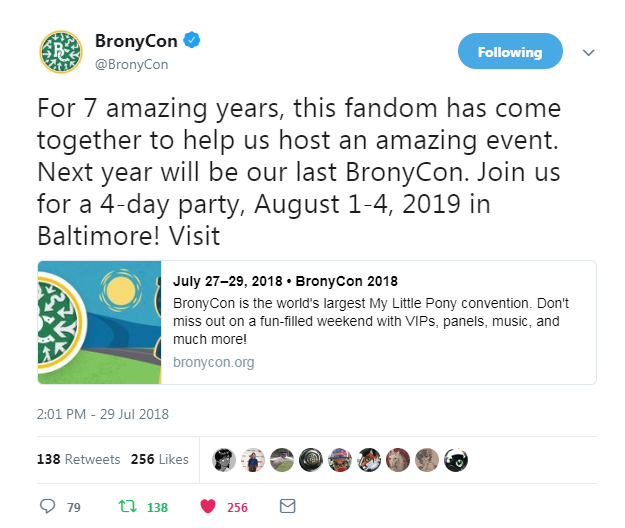 Next year, we’re turning BronyCon into the best celebration of the fandom we possibly can, and we’re making the event bigger than ever before. 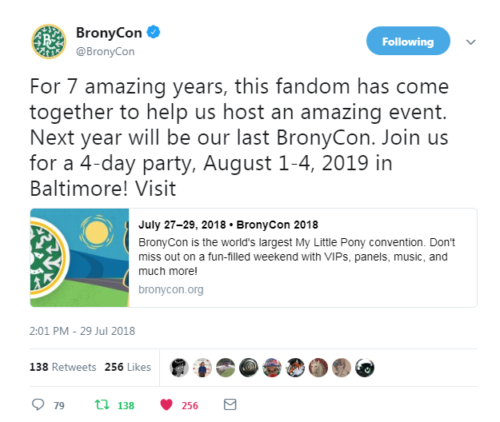 BronyCon 2019 will take place Thursday, August 1st, through Sunday, August 4th, 2019, at the Baltimore Convention Center. We’re becoming a 4-day celebration for the first time, and we’re inviting anyone and everyone who wants to party with us to come to Baltimore and join us in one last incredible celebration of community, love, friendship, and magic.